UPDATE: the source code is now online at Github! Have you ever wondered how much of your time at work is actually spent working? This app can help you find out. 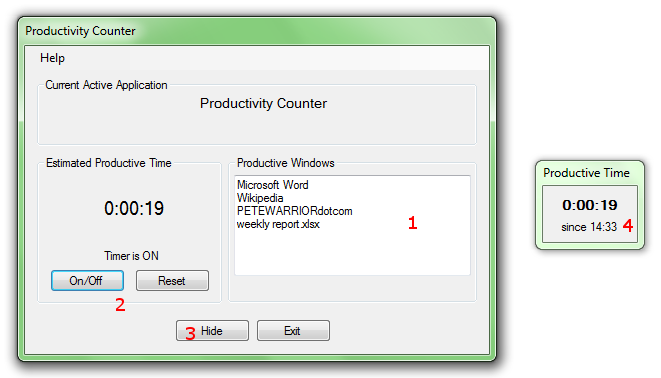 Productivity Timer is a utility that detects whether or not you’re using a productive application (e.g. word processor, spreadsheet, IDE) and keeps track of the time you spend on it. It’s currently in beta, so there may still be some errors. To try it out, you’ll need the Microsoft .NET Framework version 2.0 or greater (latest version is 4.0). I suggest you get it first before installing ProdTimer! Enter the productive window names in the “Productive Windows” textbox, one line per app. This can be the application name, website name, IM username… any text in the window title bar. Click Hide to hide the main window (you can open it later by double-clicking the clock icon on the system tray). The “Productive Time” dialog will show the total time spent on productive activities. To pause the timer, simply click this dialog to make it active (provided it isn’t listed in “Productive Windows”). Of course, this system is rather easy to cheat… but then that’s just deceiving yourself! Application icon made by MDGraphs.